Brother Martyn Ballestero, over at his Home Missions Chronicles blog, has given me a bit of inspiration to tag into for today’s blog. He wrote about preachers that used to teach off the charts. You owe it to yourself to go to his blog and read about it. I won’t rehash what he wrote but I have taken the liberties to get his pictures and post them on my blog. I, too, remember the off the ‘charts preachers.’ My own pastor, Brother Patterson, used various charts back in the ‘70’s when I was a kid. 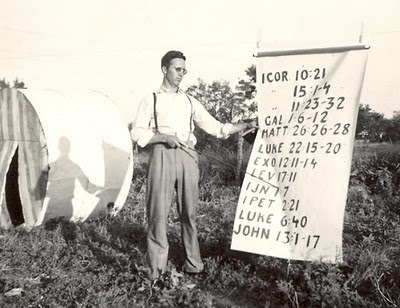 Although his charts weren’t the hand painted ones, he would routinely use the old Search for Truth charts and various others during the mid-week Bible studies. We really thought we were moving up when he started using the overhead projector with various transparencies as he taught his mid-week Bible studies. Those were the times that life seemed so much simpler and our lives had so much order and structure to them. Our days, despite all of the modern conveniences, seem to be filled with chaos as we breathlessly try to keep up with all of our commitments. Perhaps the most striking memory that I have of an ‘off the chart’ preacher was a man named Wayne Pounders. He was a gifted Bible teacher that had such ability with his teaching that even the kids would pay attention to him. To show the power of his gifting, he could hold the attention of a congregation for well over an hour and for the most part those listening were held in rapt attention to what he was speaking on. My dad was relocated to the Fort Walton Beach area and we attended the First United Pentecostal Church in Niceville pastored by Henry Dennis. Brother Dennis was big on revivals and looking back it seems like we were having a revival about every other month. Some of the most colorful evangelists you have ever seen graced the pulpit at the FUPC in Niceville. Brother Haypenny was an evangelist that was about 4 foot tall and he played the organ. What was so nifty about Brother Haypenny was that every night before he preached, he would get on the organ and tell a Bible story to all the kids as he played along on the organ in a dramatic fashion. All of the kids were awed by his stories and the flair with which he told them. I also remember a time when some evangelist came through, whose name I cannot remember, and for quite some time preached a ‘blistering’ on the church and finally Brother Dennis stood up and told him quite authoritatively, “That’ll be enough, Brother!” I was too young to remember the content of the message but what does prevail in my mind was how much Brother Dennis loved his church. My exposure to Brother Pounders took place in Niceville, Florida when I was in the 4th grade or so. His teaching specialty was the book of Revelation. He had taken four white bed-sheets and sewn them together, lengthwise, end-to-end. I would guess that each sheet was probably six feet long and the normal wide of probably four feet wide. On this large space, he had painted the whole book of Revelation. He started with John’s vision of Jesus Christ, progressed to the seven churches, to the seals, the trumpets, the bowls, and a final segment on heaven. It was incredible to walk into the church and see that sheet hung up all the way across the front of the church entirely covering the place where all of the musicians sat. When Brother Pounders came through, Brother Dennis started him on Sunday night, and then the teaching revival continued every night for the rest of the week and he would conclude on the following Sunday night. Any pastor who would even attempt to try that kind of thing in our times would be sorely disappointed because it is highly doubtful that people would make it every night. That says much about our times whether we are willing to admit it or not. Brother Pounders encouraged all to bring their Bibles to church which during those times was not a problem because everybody always brought their Bibles to church. He would literally start at Revelation 1:1 and when it was over he had concluded with Revelation 22:21. One of the things that stands out to me the most was Brother Pounders ‘pointer.’ It appeared to me to be an old car antenna and at the end of the night he would close it up and put it into his leather Bible case and zip it shut as Brother Dennis would make his concluding remarks before we went home with our heads filled with the scary images of Revelation and Daniel but our hearts filled with faith that God was going to work everything out in the end. 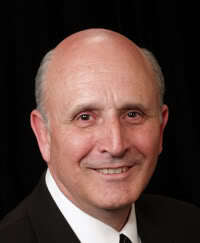 Perhaps the last ‘off the chart’ preacher that I would be exposed to was Brother David Gray. 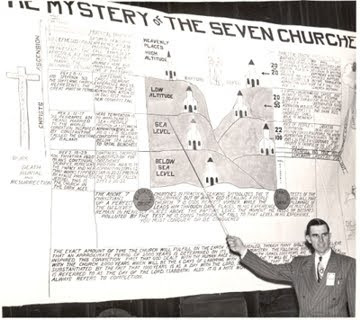 Although he did not have hand painted charts, he did use transparencies. These took place during my Texas Bible College days in Houston back in the late ‘80’s and early ‘90’s. Brother Gray during this time was beginning to grapple with his age. I look back at those days and think how I would have liked to have been exposed to Brother Gray during his prime. Heritage does not mean much to you when you are young but as your years begin to stack up there is a gratefulness that begins to appear as you think how much that God was quietly working out the details of your life. I am profoundly thankful for the heritage that I have and hope that in some small measure I am able to pass it on. 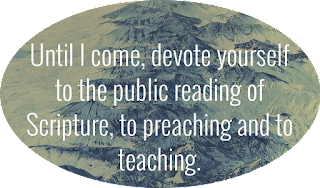 If you have any recollections of old-time off the chart preachers, I would love to post your comments that would add to the content of this particular post. The following pictures are various ones that I have in my collection. 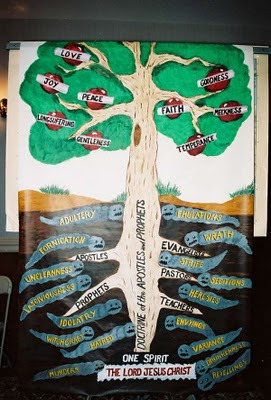 A. W. Buie's chart on the Fruit of the Spirit and Works of the Flesh from Galatians 5. David Gray pamphlet on the Two Natures of Man. I understand that he had an accompanying chart with this in years past.